Never forget a special occasion for your friends or loved ones with this calender. Measures 51cm x 33cm and comes with 30 round tags and 30 rings. Cut from 3mm MDF with burnt edges to give that rustic look. All you need is a permenant marker to write your family members name or occasion on the tag. Create memories with our family double heart. Would make a great gift for someone or just to have..
Our family tree comes with 8 engraved hearts with rings. 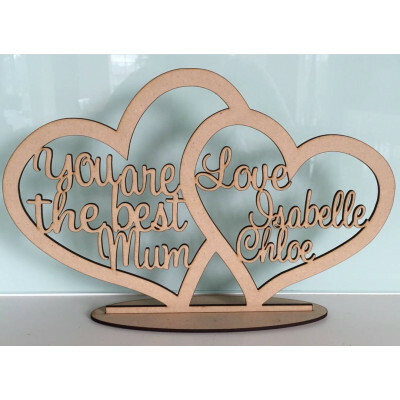 It is cut from 6mm MDF and measures 33cm..
Our 1 Line Cake Topper comes in raw MDF with burnt edges or in a variety of acrylic colours. O.. Create memories with our Cupid Heart. Would make a great gift for someone or just to have one for..